A few weeks ago, the millennial’s buying habits we’re written about and how the automotive industry was in a panic. Car makers don’t know how to market to a generation that doesn’t care too much about cars. I confirmed this trend with my teens that don’t equate their social standing with the name brand of car they drive or will drive. I’ve also posted about many car-branded bikes, like BMW, Porsche, Mini, and more. That’s not new, of course, Volvo and Volkswagen were in the sport and now VW is back sponsoring USA Cycling. Even though more Americans are riding bikes, the industry remains flat and has for nearly two decades. I predict we’ll see more efforts to attract buyers and a new generation of buyers into showrooms by car companies. The automotive industry has the dealer network, engineering prowess, and budgets to make a next-gen, bike consumers will want. 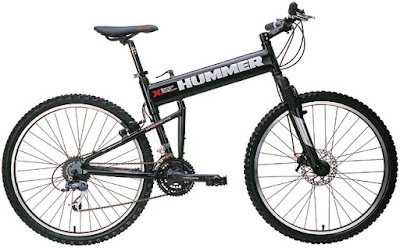 If it’s not at the high-end like Audi’s Wörthersee, then maybe a Hummer Montague folding bike brand. GM brands are hot among Japanese bike buyers. Compared with the battleship gray or dull black utilitarian bikes stacked outside Japanese train stations and supermarkets, GM-brand bikes cut a more exciting profile—because of their mountain-bike styling, prominent logos and vivid colors. Bicycles with GM logos are sold at more than 3,000 retailers in Japan. Keyword in the WSJ article is “aspiration.” Bikes in the US are always stuck between being valued as toys, or cheap, at the high end or aligned with a bike-to-work aesthetic. Little is done to create aspiration and why the Specialized Turbo was such a breakthrough – it got covered in the mainstream media. Even my teens thought it was cool. On-bike touchscreen computer interfaces with smartphone via WLAN, and video can be recorded via the in-helmet camera and uploaded via the mobile device to the web. an online portal lets trick cyclists compete against one another, earning points for successful tricks that have been videotaped and uploaded. and is on tour with a Red-Bull sponsored trails rider. Think that’s crazy? Aside from the brain-shifting Parlee and the Turbo, the most buzz we’ve seen about a bike lately has been the one for DJs. Expect something like a hamster-related bike from Kia that detaches from a car, plays music, connects to Facebook and is marketed to the Millenials or an e-bike from Toyota that’s color matched to a Prius.